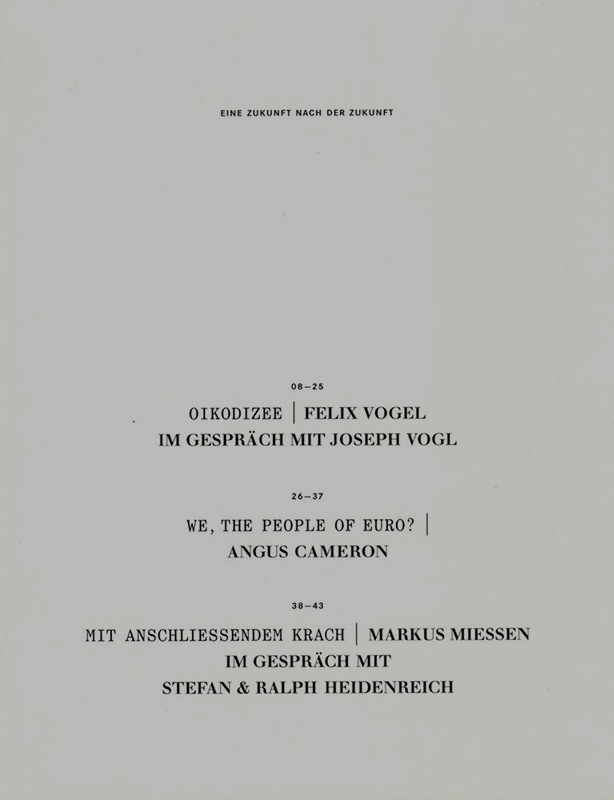 Published in German, Eine Zukunft nach der Zukunft (A Future after the Future) is a book edited by Felix Vogel and Markus Miessen as part of a series of exhibitions entitled ‘Scenarios about Europe’, curated by Barbara Steiner. 30 scenarios were created in a collaboration between the Museum of Contemporary Art Leipzig, the Goethe Institut Munich and the regional Goethe Institute in Central and East Europe, Southeast Europe, North West and South West Europe and East Europe/Central Asia, in Brussels, Istanbul, Warsaw, London, Minsk, Vilnius, Oslo and Madrid, addressing the question of: How could an art exhibition with Europe as its theme be realised in nine cities, within and outside of the European Union? In the year 2012, concrete projects and exhibitions entitled “Europe” were realised in Brussels, Istanbul, London, Lodz, Minsk, Novi Sad, Oslo and San Sebastián and in Taipei, Beijing and Shanghai. The locations were chosen as they challenge on various levels political, economic, social and cultural conceptions of Europe. China and Taiwan have a special role in the project: The relationship between China and “Europe” may be seen as exceptionally exposed compared to other relationships between “European” and “non-European” countries. Here, public reporting and political, economical and cultural activities are dominant today.